What have they done vs. what will they do? If you run a counseling office or a business of any kind, at some point you might be in the position of needing to hire someone. Most recruiters start that process by composing a list of desired education, experience, or skills, then running a help wanted ad and waiting for people to apply. The problem with that approach is that it often focuses entirely on what those candidates have done as opposed to what they’ll need to do to be successful in this new role. For example, we have a lot of counselors at Collegewise who worked as colleges admissions officers. It’s clear that their experience reading, evaluating, and debating those applications brings value to our customers and our company. But that experience alone doesn’t make someone an appealing applicant for a counseling role here. Helping someone apply to college is entirely different from evaluating that person’s application on the other side. A college admissions officer doesn’t share responsibility for a student’s college admissions outcomes the way our counselors do. They don’t explain the best approaches for one particular student to take in the application and the essays, which might be very different for the next student in line for an appointment that day. They don’t regularly have difficult conversations with families about why some schools may be out of reach, suggest schools that might be a good fit, or help each individual student make the best decisions for them about everything from classes to standardized tests to colleges. What our counselors need to do is win trust easily. They need to be astute so they can accurately read people and situations. They need to be intellectually curious to learn and retain all the information we train—and that will always be left to know—about college admissions. They need to project confidence so families know they’re in good hands. They need to get kids to like them and parents to trust them. Just because someone worked at Princeton or Duke or MIT doesn’t necessarily mean they can do all or any of those things. The experience of what they’ve done becomes valuable when paired with the innate talents to thrive in what they’ll be doing. We went through a similar process when I wrote the help wanted ad for our first inside salesperson. Sure, experience and demonstrated success in sales is a great starting point—this isn’t a good gig for someone who hasn’t already proven they can sell. And we needed people who would be comfortable when held accountable for results. But even more importantly, they needed to be teachers at heart who were as excited about helping a family make the best decision for them as they were about making a sale. They needed to be thoughtful, clear communicators on the phone and in writing. We needed people we could trust to make our first impression for us. So that’s exactly who we looked for, and thankfully, who we eventually found. So before you run the same old help wanted ad asking for credentials and experience and references, spend some time thinking about the true answer to the question, “What will it take to be successful in this role?” Those items on the resume might still have a lot of value. But what applicants have done won’t be as important as what they’ll do once they’re in the job. For counselors: The end of the safety school? High school and private counselors are likely familiar with this scenario. You have seniors who don’t want to discuss, apply to, or even remotely entertain the idea of safety schools. They believe that a school where they’re virtually guaranteed admission inherently makes that school less worthy. And they want to spend their time, money, and application energy pursuing more selective schools, many of which are those where they stand the least likely chance of being admitted. While Claire Lew’s “11 ways to get feedback from your most introverted employee” is a great read for managers, I think virtually every one of those tips could work well for counselors and parents looking to help more reserved teens open up about school, life, college, etc. For parents, though, I’d recommend ignoring #8: “Bring a notebook” (no need to formalize the talk quite so much when it’s in the family). One way high school counselors can share admissions information and advice with their community of students, parents, and faculty is to hold a workshop or other group gathering. To make these meetings as valuable as possible for you and for your attendees, consider asking three questions ahead of time. 1. What change are you hoping to make? There’s no need to bring everyone together just to share information—send an email, write a blog, post the information on your website, etc. and you’ve just saved a lot of time for everyone. When you put people in the room, you’re trying to get them to change in some way. You want them to start filling out applications, to follow the new letter of rec protocol, to write better essays or get over their fear of the FAFSA or think more about college fit than prestige. Identifying ahead of time the change you want to make helps you structure the talk to actually make that change happen. And you need to know where you want your audience to go before you start telling them how and why they should move. 2. How will you know if it worked? You’re spending time creating this talk, and your audience is spending time to come listen. How will you know if it worked? What signs will you look for as evidence that your talk got the job done? Will you hear from the English teachers that the first drafts of the college essays had improved? Will you have fewer students arriving at your offices three days before holiday break to ask for college admissions advice? Will you increase the number of first-generation students in your senior class who attend college next year? Whether the change you were seeking to make was big or small, identify ahead of time how you’ll decide whether or not your talk actually drove the change you wanted. 3. What will happen if the change does—or does not—take place? Will there be a reward for attendees who successfully make the change? Will there be a punishment for those who do not? (Hint: potential rewards work better than potential punishments do.) You can’t force people to learn or to do something. They need to want to make the change, and that journey has more gravity when there are consequences attached. So, will students who follow your letter of rec guidelines be given priority? Will you be imposing a strict deadline by which you will no longer be available to answer application-related questions? Will students who’ve submitted all their applications enjoy a stress-free holiday break? Whatever the consequence of making or not making the change, make it clear to the attendees. You need them to do more than just sit through the presentation. You want them enrolled in this journey. And helping them see the benefits or disadvantages based on whether or not they follow your lead will make people more likely to act. People often ask our Collegewise counselors about the best way to get started as a private counselor. Here’s a recent podcast, and some past posts of mine, that should help any committed professional take productive first steps to get started. On this 1-hour podcast, marketing expert Seth Godin recently shared the steps he would take if he were starting a new business today. His insight about marketing with—not at—people works very well in an industry like ours where trust is so essential. Some advice, here and here, on getting started. And an early-stage marketing idea can be found here. My thoughts on certificate programs in college counseling. Some recommended basics on which to build your business. And finally, some advice on how much to charge. 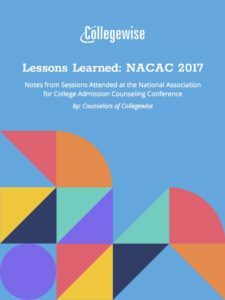 The annual NACAC (National Association for College Admission Counseling) conference serves up some of the best, most up-to-date information about college admissions. But it’s expensive to attend, and many high schools aren’t able to send their counselors. Since 2009, our Collegewise counselors have shared with high school counselors our notes from the sessions we attended. This year’s bundle of notes is complete, and you can download your copy here. Please share them with your colleagues who might be interested (there are no copyrights or other restrictions). I hope you find them helpful. My online course for counselors and teachers, How to Write Letters of Recommendation, is currently open for enrollment. I think you’ll find that this course has the power to transform the way you and your colleagues approach these letters. You’ll give your students an even bigger admissions lift. And you’ll spend less time writing, rewriting, and wondering if you’re giving the colleges what they’re looking for. The course includes videos and downloadable materials, all of which can be completed at your own pace. It’s fast, it’s focused, and best of all, it’s just $19, with a money-back guarantee if you’re not satisfied for any reason. All the details are here. I hope you’ll join. For private college counselors running your own shops, one of the keys to standing out and doing great work is deciding who you–and your expertise–isn’t for. What kind of guidance or support can a potential customer request—and be perfectly willing to pay you for—that you’d politely decline and refer them to a competitor who’s a better fit? I don’t mean a family who’s requesting a service that’s wildly out of your expertise, like asking you to tell them what kind of roofing to put on their house. I mean a family who wants a type of college advising that you have actively decided is not where you hang your professional hat. Maybe a family has an athlete who’s hoping to be recruited, or a student who’s not that engaged in the college process and needs someone to light the fire, or parents who are primarily concerned about the cost of college and are hoping you can help secure financial aid and scholarships. It’s hard to imagine any counselor who could help all of those families equally well. And if you can’t do great work for a family, don’t they deserve to find someone who can? And don’t you deserve the opportunity to do your best work? Saying no gives you both that opportunity. It’s temping when running any business to say yes to anyone who’s willing to pay you. You want to pay your bills. You want to earn a living. You want to grow your business. Why shouldn’t you say yes, especially in the early stages, if all it will mean is a little extra work and learning on your part? But saying yes to everyone is a path to owning a business that’s just like all the others. Deciding who your work isn’t for is step one to creating a business people talk about. Now the photographer can focus on becoming so good at servicing the unique needs of her clients that she becomes known as the one you call when your wedding will be indoors. The caterer can put his energies into becoming the one in town that people talk about because of the show he put on for their dinner party. The accountant can become the one in town that small business owners talk about because she helped them make their businesses more financially sound. Sure, you’ll still need to do great work to stand out. You’ll need to create experiences for your customers so remarkable that they can’t help but talk about you. But it’s a lot easier to do that for a smaller segment than it is to do it for everyone. And the first step towards identifying your smaller segment is to decide which members of the larger segment just shouldn’t hire you. If you have trouble deciding, consider three things. 1. Who’s your ideal customer, the person who’s predisposed to be thrilled with what you do and how you do it? 2. Are there enough of those people to sustain your business? 3. And most importantly, what could you learn, do, and provide to that group that would make them feel like you’d created the perfect service for them, one that understood their desires, fears, and hopes for their college process? Now, who doesn’t fit in that group? To find the groups that will buy, appreciate, and talk about your best work, start by deciding who your service isn’t for. In 2013, I shared my five summer suggestions for counselors. But Patrick O’Connor’s latest piece for counselors, “What Not to Do Over Summer Break,” offers some even better tips to help even the most dedicated counselors unplug—and recharge—this summer. For counselors: What’s new with the Common App? The folks at the Common App held a free webinar for counselors yesterday: “What’s New With The Common App: Enhancements.” If you didn’t get a chance to attend, our counselor Tom Barry shared the following summary for our Collegewise counselors. You won’t need to find your way around a brand new Common App with your students this year. In fact, the key changes are mostly minor and will not affect all applicants. 1. Students can now self-report courses and grades within the Common App tab. There aren’t many colleges on the Common App that ask students to self-report their courses and grades, but for those that do, the Common App now offers them a place to do so. 2. Students can upload Google Drive text files directly into the “Essay” boxes. This won’t replace the option to copy and paste. But one potential benefit is that uploading a document could help a student avoid those pesky formatting challenges that seemed to pop up so often. 3. The “Activities” dropdown menu will now include “Internship” and “Social Justice” categories. 4. Students can select up to three advisors who will be granted access to their account in order to evaluate progress. This number is in addition to the formal school counselor and the teacher(s) submitting letters of recommendation. We’ll also be releasing our updated annual Collegewise Common App guide around July 15. When it’s ready, I’ll share it here.